Alex got a rainbow of model clays and using just a standard Nintendo 3DS made the following stop motion videos(in one weekend). These were the best ones we deleted a load! When uploading that video I found a load of images time lapse style that we had taken at Christmas of the kids building the big Lego arctic set. Think I need to work on my ffmpeg foo regarding the frame timing. This weekend has been all about videos. First off Joseph(who's 6) teaches you how to use the XLoBorg that he got in his Pass the Parcel bag from the Raspberry Pi Birthday party. Thanks PiBorg for donating that. In this video he teaches you how to prepare the Pi, install the board, set it up, get it working and then make it talk! More more more party maker fun. In our "Pass the Parcel" bags we got some soldering kits from watterott electronic (massive site, could get lost for days). First up I had the kids watch some of the cool videos showing what the drawdio could do. Once they were hooked, we had a quick safety lesson and the free bright orange kids safety glasses from stand become indispensable. There are quite a few components and it was a bit daunting, what with the printed instructions being in German. We used Adafruits guide, but I have since found the official one. I would either holder the iron or the solder and the kids would take turns to attach the components. We all learned a lot about the different components and which ones can be attached in what orientation. The Drawdio did not quite work. First off it just did not seem to work at all but the more handling it got the more sensitive it got. But the user had to touch the graphite directly it did/does not work through a drawn line. Which is odd because if you put a piece of wire down to take the place of the pencil line it does work. Not really a problem, the kids love it. I wished we had started with the OSHW-RGB-Badge it has only four components to solder and a large area to do it in. Having got our hands dirty earlier in the week with the Drawdio both kids found it very easy to complete the badge. And believe it or not there is still MORE stuff in our swag collection to investigate, soon. This time it was an obscure looking leaflet at the bottom of each of our party bags. It was a free eBook from O'Reilly books. So we each got a very nice DRM free Raspberry Pi eBook. Really impressed that everything is DRM free so we can load these onto our Kindle Fires! Last time it was Alex using "Adventures in Raspberry Pi" book from the Raspberry Pi 3rd Birthday but what does Joesph think of it? Knowing that his brother had had fun in Scratch was enough(more than enough) to get him excited. Instead of a robot disco he was much more interested in Baby boogie. This time we managed the loop of loops pattern and selection of instruments instead of music loops. One very happy six year old. So is that the end of the continued value we have had from the party? not yet! Even more Raspberry Pi 3rd Birthday updates. I mentioned the "Adventures in Raspberry Pi book"(signed by Carrie Anne), well it has sat on Alex s shelf and I wanted to make a point of how accessible the information was in it. Gave him the book and asked him to look through it. "mumble mumble" and a half arsed flick through the book skipping 50 pages at a time and not looking any way. Tried a few encouraging words but no, to an eight year old a book is a book and that means work. I pointed out that there was Scratch programming in it. "mumble, I know it all, mumble". There were some screen shots of using Scratch to do turtle style programming and one in particular shows a colourful repeating loop pattern. The moment I showed him that, it was "Can we try that? right now?" The instructions were detailing drawing lines with the pen mode and looping the results. We quickly made a basic polygon and then swapped the "boring" values for Random ones. The drawing character (an imported robot) ran around in a crazy way. Then we made the pen size and colour random and that's when it got a bit surreal. The point of the exercise is to make ordered repeatable patterns. We ended up with the robot disco. You see the robot was rotating a random amount each frame and the pen size was randomly bigger than the entire screen, it did look like a disco. so we added some of the loop-able samples that come with Scratch. One very happy eight year old. It works now and I have no idea why. The fact that the leaky one has more checks is not lost on me. Now its 4 months since I raised the bug and over 6 months since I started looking at the problem. This machine needs regular updates and it was one of those messy updates last week that I reckon fixed the leak. It involved a large number of packages, not least the Kernel and the ATI binary graphics card drivers. Bottom line is simply, this issue I wished would go away by itself, has gone away by itself. Strangely I am not happy, would have loved to get the bottom of this. Still I can finally finish my home page animation widget. Unplugging the USB dongle and re-plugging it. Restarting the Pi. Nothing worked the Bluetooth address stayed the same. still showed the old address. Everything I read said Cambridge Silicon Radio (CSR) based USB Bluetooth dongles should work. shows the chip version is only 01a and as v4 was out in 2010 I do not think I can go much further. Oh well, it was cheap. add line "blacklist hci_usb" into /etc/modprobe.d/raspi-blacklist.conf and line "hci_usb reset=1" into /etc/modules. After reboot dongle work stably well." I tried plugging both Bluetooth adaptors in and they both worked, sort of. The Bluetooth address was the same on both devices so I could not ask one to connect to the other. Not to worry it must be easy to change the address? nope. The tool needed "bdaddr" is not included in any packages and must be built by the user. but not to worry "bdaddr" was built, success! One of the things I have never had but has been cheap enough to buy on a whim is a Bluetooth USB adaptor. I order one a couple of months ago and stored it unopened in a draw. On opening it I found it was two wedged together, time to play. I mentioned the Space Invaders and Tetris party games that I scored highly on at the Raspberry Pi 3rd Birthday party. It seems I did not get the highest score on those but rather remarkably I did score the highest on another party game. Yes I am the "Naughtiest" at the party (in the adult section). No idea what I won but the game was a random number generator based on your hand size. When I child put their hand in the scanner they got a low "Naughty" value and when a larger hand was presented a large "Naughty" value. Maybe I just have the largest hands of anyone who tried the game. WOW! The kids and I are still reeling from the awesome that was the Raspberry Pi 3rd birthday party, if you use the "last day in February" rather February 29th. It started well with the organisers making a huge effort to provide (well in advance) as much detail as possible, not to mention the low cost. not to mention all the great staff, sponsors and volunteers. Thanks to everyone for making it such a great day!! So what did we walk away with? First up I bought a CamJam EduKit #2 tinfor each of them, which was funny because we then used similar kits to connect LEDs to the Scratch environment. Then there was the Swag just walking around between the stalls. Some were shops like Pi Hut and ModMyPi, other companies like RealVNC and Ragworm but also individuals showing off their projects(of which I have failed to list many, above). From the swag we ended up with bags, badges, pens, hats, key rings, licence keys, stickers and even safety glasses(for soldering). The Party bags we got on leaving were good as well. 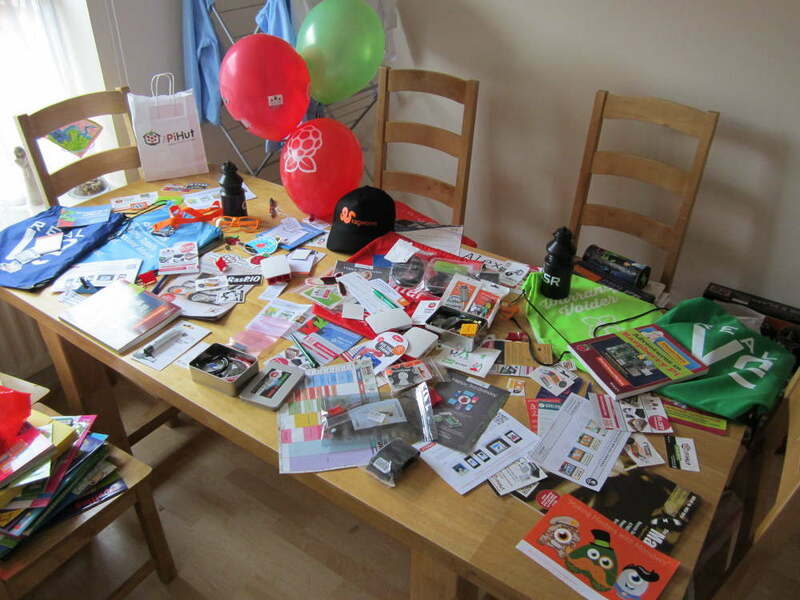 Balloons, cables, stickers, USB key, stickers, water bottles and more stickers, plus money off, free ebook downloads and a printed copy of the MagPi magazine(old copies, but we love 'em) each. Finally we have the pista resistance the Pass the Parcel prizes. This game was madness as no one knew what was going on and the PA operator was not understandable. It started off with about 100 people all standing around the main tables expecting to play classic "pass the parcel" and when a number of prize bags were given out it was not to surprising. But then more and more bags were given out and we were told to keep passing the down. This went on for what seemed half an hour before I heard someone remark that if the bag you had had something you wanted you could just step away from the tables. We could see into the bags to a small degree, some where large or heavy others light and small. Finally the music started and the chaos ensued. There were back logs where slow people were causing presents to build up and then the music stopped and everyone started at the bag in their hands. Of course by this point some people were sans bag. Unsure if that was it and we should open out bags the music started again! This time some people had left the tables with bags. Was this what we were supposed to do? When the music stopped we cut out loses and took what ever we had. What a mixed selection we got. I got a LED badge soldering kit and a Drawdio, Joseph got a collection of stickers, some sew on patches and a Pi Borg - xloborg . Alex got the Adventures in Raspberry Pi book. Then someone handed Joseph a conductive ink pen(unopened) and later when were "helping" finish the pizzas someone else gave us another copy of Adventures in Raspberry Pi book(which he later got signed by Carrie Anne), we did not know the first book was in the original bag. Here is most, but not quite all we came home with. I did not put out some of the worksheets or spread out all the stickers! thank you from Alex, Joseph and me(dad). Of course, now the real fun starts. The kids are desperate to start hacking!